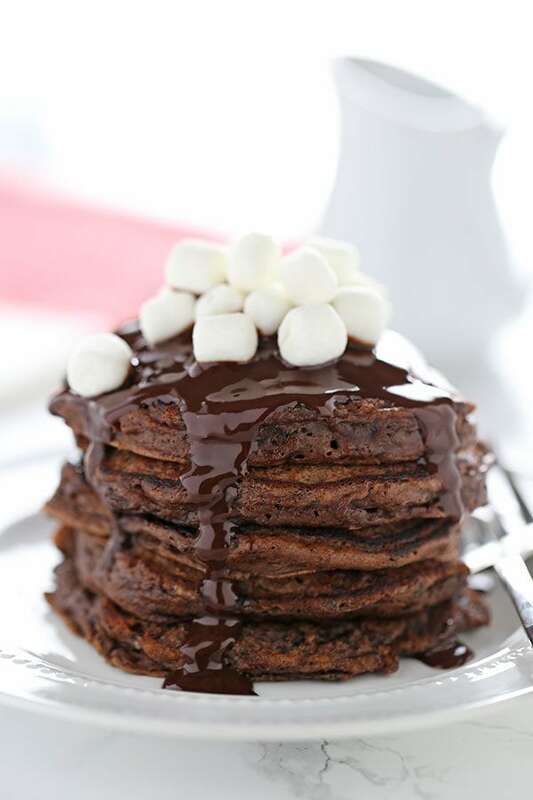 Hot Chocolate Pancakes feature rich chocolate buttermilk pancakes with a thick chocolate fudge topping and garnish with mini marshmallows. Perfect for Christmas morning! Taste: Ultra rich and chocolaty, just like hot cocoa should be! 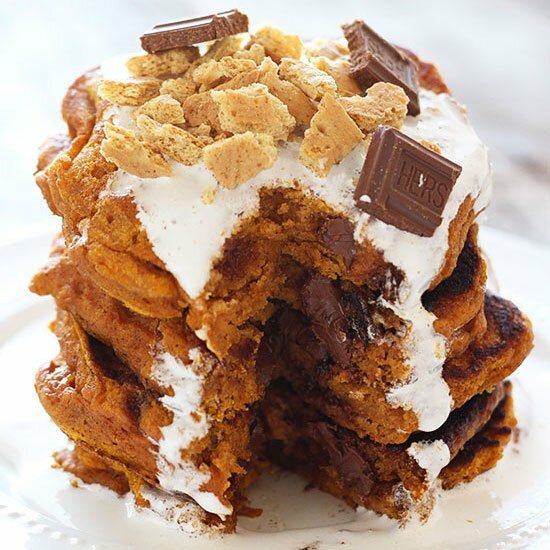 Texture: The pancakes are thick and tender but the rich and creamy fudge topping with sticky pillowy marshmallows just takes it to a whole new level. Ease: Super easy, takes less than 30 minutes! 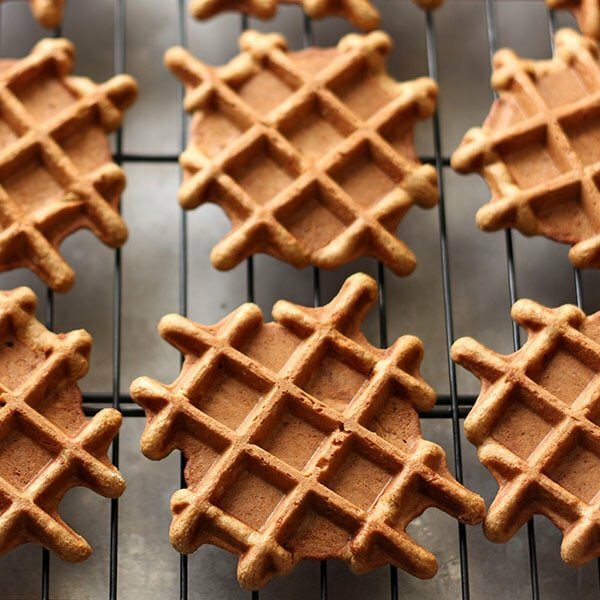 Pros: Fun and festive breakfast treat. Cons: Not an everyday breakfast. Would I make this again? Absolutely!! There’s so much that goes into the magic of Christmas morning. The anticipation, the pajamas, the food, the music, the presents, the Christmas tree, and of course, the sense of family and giving. As a kid, unwrapping the last present is sort of depressing. That means it’s almost all over. But that also meant it was almost time for Christmas breakfast, which made the depressing fact that presents were done with that much easier to accept. 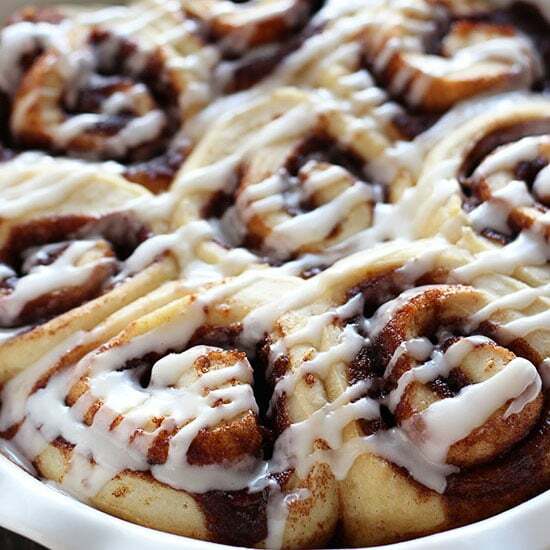 Our family tradition was almost always cinnamon rolls. 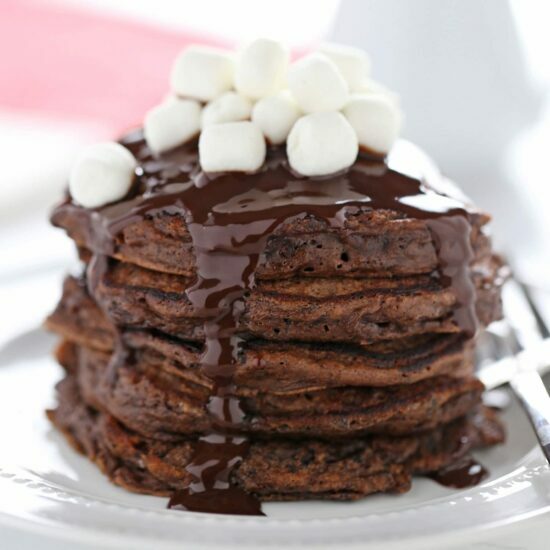 This year, however, I think I’ll be making these Hot Chocolate Pancakes! As a chocoholic, this recipe satisfies all my cravings instantly. If you make any of my recipes this holiday season, be sure to tag me on Instagram and use the hashtag #handletheheat so I can see them and feature them on the blog. In a small microwave-safe bowl, microwave the chocolate chips and cream until melted. Stir until smooth. Set aside. In a large bowl whisk together the flour, cocoa powder, sugar, baking powder, baking soda, salt, and cinnamon. In a medium bowl whisk together the egg, buttermilk, and melted butter. Pour the wet ingredients into the dry ingredients and gently stir until just combined. Do not overmix, it’s okay to have lumps. At this point the batter can rest, covered, for up to 30 minutes. Heat an electric griddle to 350°F, or a large nonstick pan to medium heat. Coat with butter. Pour batter by 1/4 cup onto the hot pan, spacing apart. Cook until the edges are set and bubbles have formed on the top, about 2 to 3 minutes. Gently flip and cook for 1 to 2 minutes, or until done. Keep cooked pancakes warm in the oven while you finish the batter and get ready to serve. 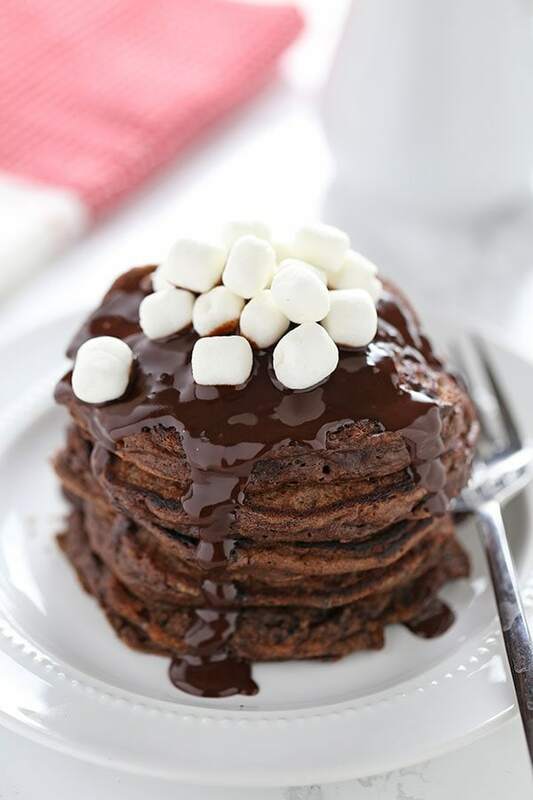 Stack pancakes on plates and top with the fudge sauce and mini marshmallows. Very inviting idea ! Great bright photos ! Thank you ! If you have one, why not give those marshmallows a quick toasting with a crème brulee torch!? I’m definitely going to try this recipe out on my boys this year! Absolutely! I try not to use mine in too many blog posts since I know most people don’t have one in their kitchen. Want to try these for Christmas. Says serves 4 but does any one know about how many there are if about 4 inches? Oh my gosh! Looks damn delicious. Do you have a youtube channel? I can’t make it as tasty as you did. It looks so delicious! I like them! had to dive into this recipe from the photo on the front page of your site, what a fund recipe! Christmas, or really any other day works for me, thank you for this and for the tip that you wouldn’t necessarily make this every day but still delicious, kinda like lobster cheesecake, super-rich and crazy but still really good!